Why Listen? To hear tunes perfect for looping and letting run in the background as you scribble away; for the sorts of sounds from which great SF is made. This ongoing series normally follows a predictable pattern: Each entry highlights a single song from a specific artist that I think might jumpstart listeners' creative processes through some combination of lyrics and music. Today, though, I'm going to mix things up by suggesting you listen to an entire album without any verbal content whatsoever, namely Michael McCann's original soundtrack for Deus Ex: Human Revolution. 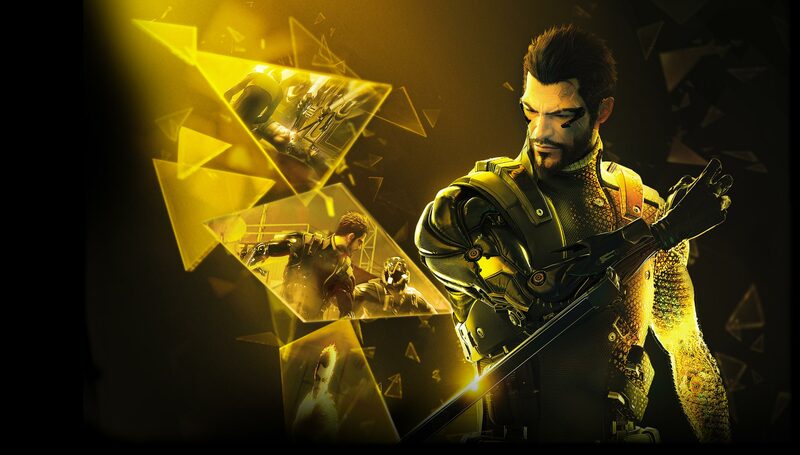 For those unfamiliar with the title (which will likely be most of you), Deus Ex: Human Revolution is a 2011 cyberpunk video game focusing on private security contractor Adam Jensen. When shadowy mercenary types attack his client, controversial human-augmentation corporation Sarif Industries, Jensen is horribly wounded. His employer takes advantage of a clause in his contract to make him into a 21st-century version of The Six Million Dollar Man, and afterwards Jensen begins the hunt for those who maimed him and (presumably) took the life of his longtime love. Honestly, though, the plot will hardly matter to most writers. The important thing is how McCann translates the game's striking style into aural enjoyment. In addition to open gameplay and near-future reimagining of everwhere from Detroit to Shanghai to the Arctic, Deus Ex: Human Revolution garnered kudos from critics and gamers alike for its visuals. Developer Eidos Montreal kept all the expected graphical detail while stripping the color palette to black and gold, giving the title an almost monochromatic starkness. McCann incorporates that lean feeling into the soundtrack through jittery synth riffs, piano chords, and a handful of traditional Chinese stringed instruments. Many of the tracks lack any sort of persistent beat whatsoever. Which makes them perfect to write by. As Jensen jets around the world, McCann keeps slips the main musical into several ambient compositions. "Detroit City Ambient (Part 1)," "Home," "Lower Hengsha Ambient (Part 1)," and "Singapore Ambient (Part 2)" are all plangent, minorish tunes perfect for looping and letting run in the background as you scratch away with pad and pen. Others could serve as break-time inspiration. "Hengsha Daylight (Part 1)" calls to mind the stirring wakefulness of Asia's demographic might as night surrenders to morning, and "Hung Hua Brothel (Extended)" uses an urgent beat to marry melancholy with yearning. They're the sorts of sounds from which great SF is made.